If you’re a busy person – and who isn’t these days? – you know that a tidy house is often the first casualty when you’re running on a tight schedule. This is unfortunate, since having an organized and cleanly home can improve your mood and lower your stress levels. Being stressed and unhappy can wreak havoc on your ability to be productive, so you should make sure you’re keeping your space at least somewhat clean. If you don’t have time to keep everything spotless 100% of the time, here are five small and simple daily task you can do that’ll prevent big messes from piling up and stressing you out. 1. Make your bed every weekday morning before you start your day, or at least do it after you’ve had your first cup of coffee (I must have my coffee before I do anything else because I can’t function without it). The simple act of tiding your bed is a great way to begin your morning routine. It is in a way like putting a period at the end of a sentence, you are saying “Goodbye” to sleep and “Good Morning” to a new day. I find that pulling up the covers and carefully placing the fluffed pillows makes it easier for me to jump start my day. I like to keep things unpretentious when it comes to bedding. Too many pillows or mountains of blankets (that aren’t needed for night time snuggling) just get in the way. Besides, your bed should be a beautiful place to rest, not a resting place for beautiful but unused pillows or blankets that get thrown on the floor when it is time to climb in. One or two extra pillows for propping yourself up on the occasion that you get to lounge the morning away is fine and I usually keep a folded blanket across the end of the bed for those cool nights that a little additional warmth is needed to sleep soundly. The less you have on your bed, the more likely you are to make it in the morning and once it is done you will experience a small sense of accomplishment. There is a certain amount of satisfaction that comes from being able to check a task off your list first thing in the morning. 2. Tidy up the kitchen before you go to bed each night. 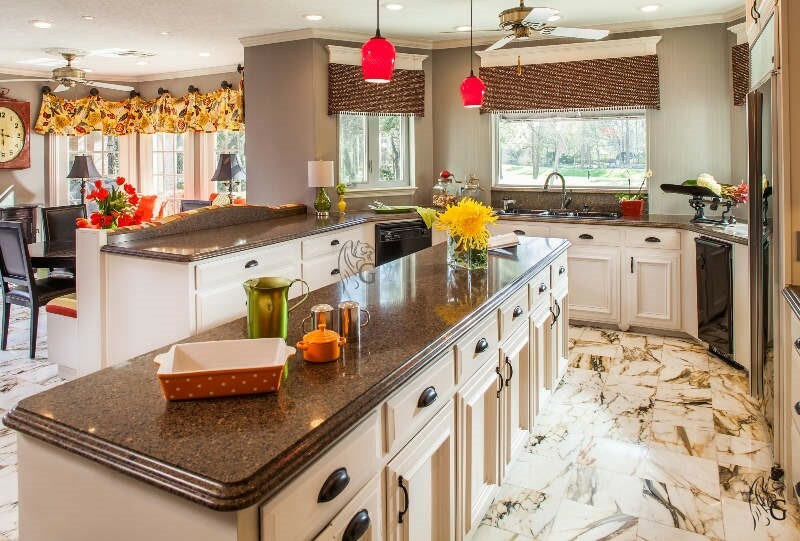 If the dishes are done and the counters are wiped down at the end of every day you will wake up to a clean kitchen the following morning and that will make you smile, I promise. There is nothing, and I mean nothing I dread more than walking into a dirty kitchen at the start of my day, especially during the week. Not even a cup of coffee makes me feel better. Almost everyone despises doing dishes (my daughter-in-law is an exception, but she has been diagnosed with cleanfreakzophrenia) but a routine can make it more tolerable. My routine is to rinse and load the dishes into the dishwasher just before bed then I let it run while we are all tucked in and dreaming the night away. In the morning I unload and that means there is no excuse for why others can’t load their dirty dishes throughout the day. This makes for easier and faster clean-up each night because I only have to take care of the dinner mess instead of an entire day’s worth of dishes. In the spirit of full transparency, you should know, I have one of my children do the dishes each night. It builds character, teaches responsibility, and besides, I typically do the cooking so I’m too tired to do the dishes. 3. Freshen up the bathroom when you are done with your personal hygiene practices. Hang up your towels, make sure you have enough towel bars or hooks for each towel used so that nothing ends up on the floor. Wet towels left on the floor not only look untidy, but the moisture makes the bathroom smell bad if left there for a day or more. Store your beauty products and put away the tools you use to make yourself look and feel fabulous. When items such as toothpaste, hairspray, deodorant, a flat-iron, or any other number of things we use to primp and make us presentable to the world are left out on the counter it can feel cluttered and messy. Use organizing methods to make putting things away quick and easy. I use a wire basket attached to the side of my bathroom cabinet to store my hair dryer, flat-iron, and curling-iron. Wrap the cord, drop it in the basket and it is out of site. Keep a minimal amount of items on the vanity so you can wipe it down swiftly when you are done with your bathroom routine. Doing these things daily will not only help encourage a positive outlook but they will also aid with deep cleaning when the time comes. 4. 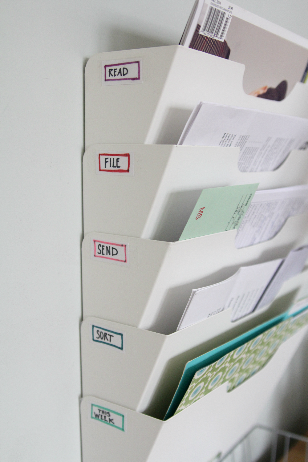 Keep paper organized as you aquire it. It takes less effort to put away papers immediately instead of keeping documents hanging around the house. When bills come in put them in one place and as each one is paid, file it away. This habit encourages productivity and eliminates confusion. If a bill is filed it has been paid, yea you! If it hasn’t, this task is still on your to-do list. Put any take-out menus in one place, so they are easily accessible when a craving hits or you just can’t pause the movie to prepare dinner. Coupons should have their own place too. Organizing magazines makes for easy reading and be sure to purge regularly, you know, out with the old and in with the new. There are so many storage solutions for these items that you are sure to find a few that work for you. I get some of my best ideas from social media sites. 5. Put shoes and clothes away promptly. I’m not talking about folding or hanging up clothes at the time that you wash and dry them (although that is important too), I’m referring to putting your shoes or clothes that you have removed from your body in their proper places. 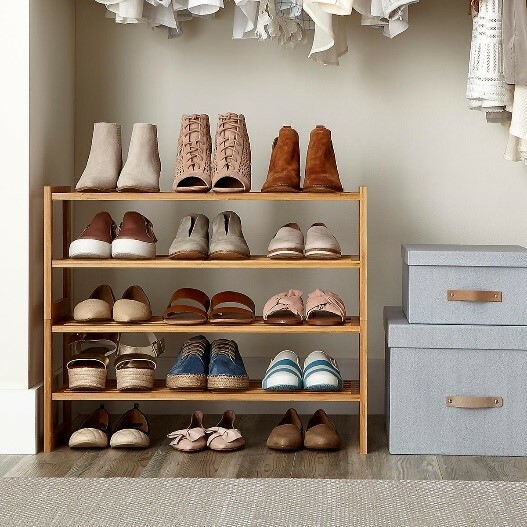 For example, when you take your shoes off they typically go in a closet to be stored on the floor, in a box, or on a shoe rack until the next time you choose to wear them. Coats should be hung up once you come in from the cold, assuming your heater is working. After you get dressed for the day, put your night clothes away to be used again or throw them in the hamper to be washed. Don’t leave your dirty garments on the floor, they should be tossed in the hamper straight away. Easy peezy, nothing laying around to trip you up in the middle of the night when you get up to sneak a snack, and when the hamper is full you’ll know it’s time to do the wash. There are so many responsibilities and so little time. From the moment we wake up we can feel overwhelmed by all the things that need to be done. Luckily, you don’t have to wake up at the crack-of-dawn to have a productive day, you just need to have a daily routine that works for you. The point of having a specific routine is to set yourself up for success from the minute you get out of bed. How you start and end your days can have a big impact on your mood and productivity levels throughout each day. These five tip are intended to be a starting place on your road to increasing your productivity, and make it simpler to find time to do the things you want to do.